Here's a blueprint for challenge which could give a group at least a morning's fun. It would be a pretty "concentrated" morning. An hour's "preparation", a few hours' "doing it", and an hour or so of "follow up" might be a more realistic schedule. It may be helpful, if you haven't already done so, to read through simple "make a map" challenge, before studying the following. First at least imagine doing what's in the simple challenge. If you are going to give a group the chance of the challenge that follows, the simple challenge might be good preparation. The intermediate angle measuring challege would also be useful preparation. Before you get too excited, I should point out that this isn't a trivial exercise that you could take many groups through in a single afternoon. Most would need to do a simpler, preliminary challenge. There's also the matter of providing each team with a theolodite, unless you go the plane table route. Of course, making your own theolodite is a worthy challenge in its own right. I would be delighted to publish (as sub-pages of the "make... theolodite" page) reports of your discoveries on that journey. Illustrations, and discussions of the instrument's virtues and vices (accuracy? ease of use?) would be especially welcome... but just a photo and a quick note adequate, too. Don't do it for the possibility of cash... but if you do run this challenge along the lines set out, and involve more than 5 kids as individuals, or more, in at least 5 teams, then cash is on offer for good material which can go into a subordinate page for this webpage. Once results from three groups have been posted here, a further prize of at least $50 will go to whichever group has provided the best material. Names of winners, where the money was sent, will be posted here. I've created a subordinate page with further details for interested parties. If three "case studies" have been written up, but you can offer something better, it is not out of the question that further prize funds might be found... but if three case studies are written up, there are no promises! From A to B should be about 60 feet, but other distances can be made to work. Throughout, I've tended to talk of "participants". People could work in teams, with two or three people working as "a participant". All issues of health and safety are UP TO YOU. What would happen to a participant who happened to trip, and land on one of your tent-pegs/ spikes, for instance? Be safe! X, Y, and Z should be in the center, about 8 feet apart. Again, placement is not critical. What is critical is that the four points on each line be on that line. E.g. A, A-f, B-f and B should all be in line with one another. There will be nothing in the "challenge arena" where I've done the dotted lines. There will be nothing where I've done the blue line... that is just a boundary... participants are not allowed inside it. The presence of an A, and an A-f, B and B-f, etc, might seem an unnecessary complication. The reason for setting things up thus is to keep the team at A well away from the "flag" at A-f... the point to which many other people are trying to take a bearing. The organizers should also give the participants an accurate number for the distance from A to B. We will agree ahead of time that AB runs "West to East" in our FLAT world. And instead of longitude and latitude, we're going to have a simple 90 degree, uniformly spaced, grid, in meters. And the "coordinate system" will have to be declared, based on a declared location for "A". It should be declared to be at something like "2,20". Participants should be warned in advance that their map will start from nearly arbitrary placement of dots on their map for A and B. The participants need at least one GOOD other position, in order to complete the whole process, so their turns at locations A and B need to be spent carefully. Participants should be told the scale to be used in drawing the map, and care will need to be taken to set everything up to make a simple scale workable. 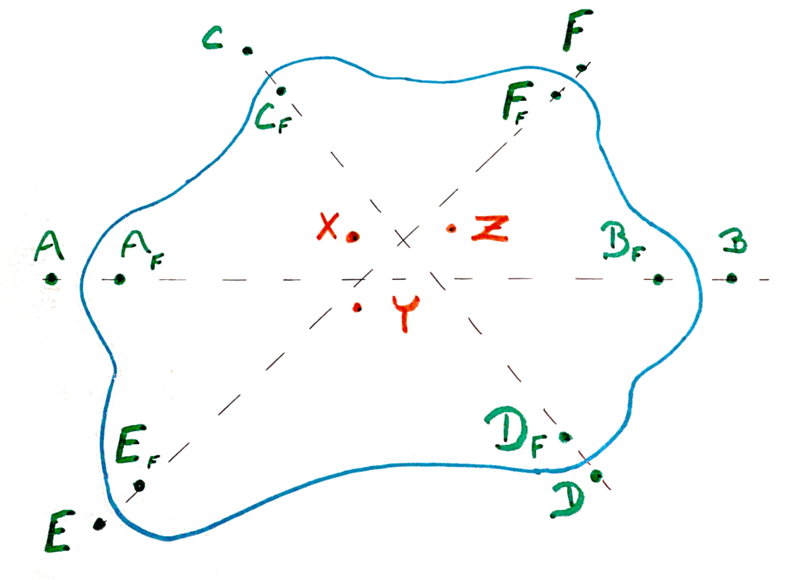 Once everyone is clear on the above, participants start measuring angles.... but all of the angles apices will be at A, B, C, D or F.
After an agreed time, angle measuring stops, and the participants go away to draw their maps, figure out where (by coordinates) X, Y and Z are. No one is allowed inside the wavy blue line... i.e. near A-f, B-f, etc. People must try not to block other people's line of sight! Each participant (or participating team) should work out the coordinates of X, Y and Z, and submit them to the adjudicators at the end of the time allowed. The judges should have discretion to "throw out" any poor entries. For the remaining maps... and this might more easily be done with a relatively simple computer program... the "best guess" positions for X, Y and Z could be taken to be the "average" of the results of the good maps. Alternatively, if the judges trust their skills adequately, they could enter the forbidden zone, and measure the locations directly, using a taut line stretched between A and B, and a tape measure. 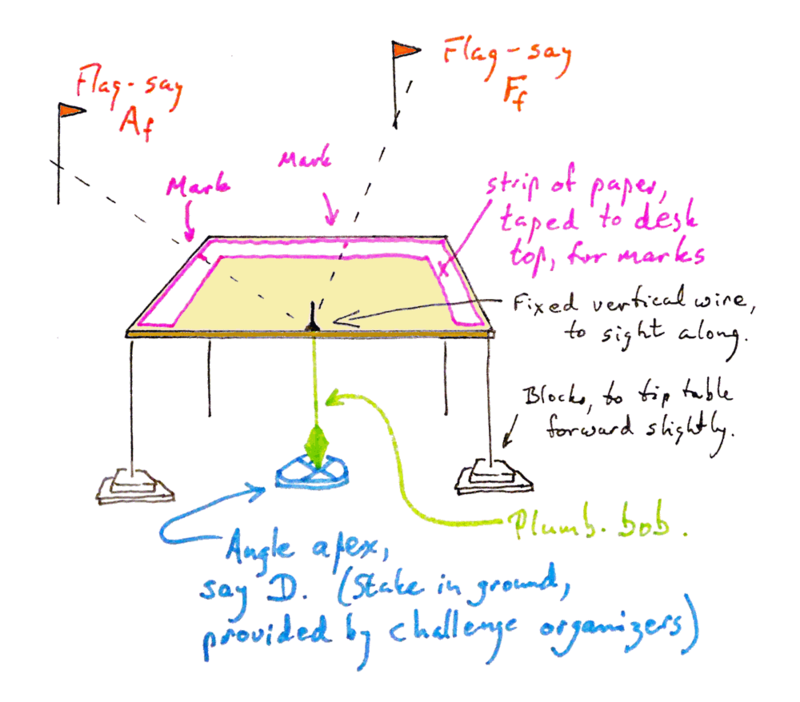 Each participant's score would be the sum of six figures: How far out their x and y coordinates were for the three flags inside the ring. Or you might choose to run three competitions side-by-side... with separate prizes for determining the positions of X, Y and Z. Or you could get fancy, call in Mr Pythagoras, and calculate how close each determination was, in a straight (though diagonal) line. Put two dots on the sheet of paper, one for A, one for B. The known coordinates of each of these, and the "set" scale, and a promise that nothing needs a negative coordinate should make it easy for the participants to put A and B in the right places. This does not make the exercise unrealistic... it just saves the mess of having to stick extra bits of paper on at the edges of the maps to get everything on the page. Knowing the scale, and the A to A-f, etc, distances, and knowing that A, Af, Bf and B are all in a straight line makes it easy to put Af and Bf on the map. From here, there are multiple solutions. A participant might have measured ABFf and BAFf. That would give him/ her the position of Ff. If they also had BAEf and ABEf, that would give them Ef. With Ef and Ff, they have the line for E, Ef, Ff, F... and they can do E and F from knowing the distances E-Ef and F-Ff. NOW angles measures from E and F can be used in further developing the map. 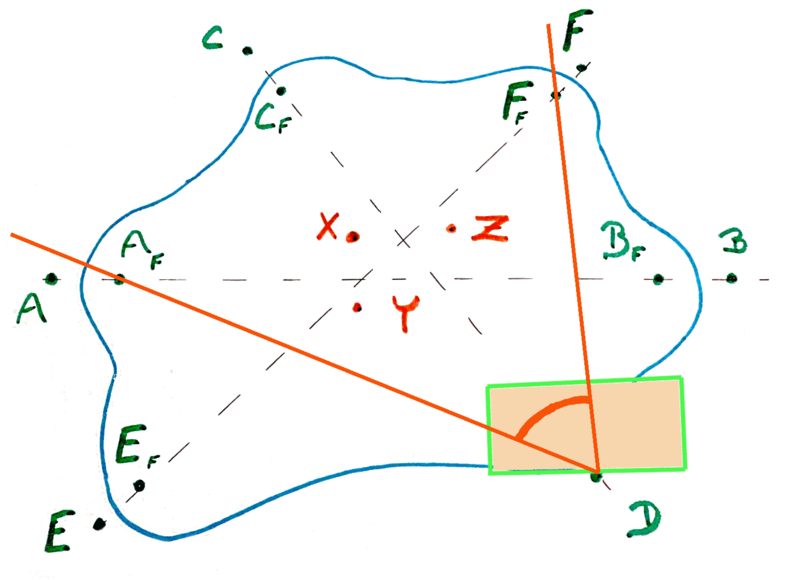 Just six angles to and from A and B, and knowing the length of AB would be enough to plot X, Y and Z on the map. But the more angles the participants measure, the more data they have. Unless they have advance theolodites and superb craftsmanship, the "extra" lines they can generate for where each of the unknowns is located will not all cross in exactly the same place. Judgement will have to be exercised, to decide what weight to give each of the competing indicators. After I had put a great deal of work into this page, the nasty thought that no one will read it, let alone implement anything like it came into my head. If you do try these ideas, I would be thrilled to hear a bit about how it worked out. Suggestions for improving the page very welcome, of course. I taught in boarding schools for many years, and organized things like this as Sunday afternoon activities, back in the days when boarding schools were boarding schools. Unfortunately, for me, anyway, I no longer have pools of bored kids to entertain.